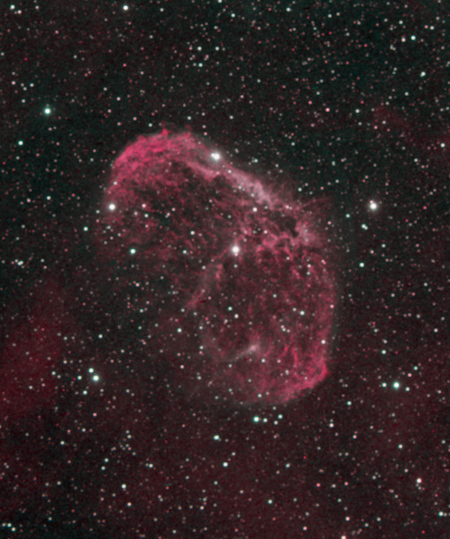 Last night’s imaging session was once again NGC 6888, but this time with an OIII filter. Unfortunately the sky became hazy quite early, so the OIII images are very noisy. However, here is what you get when you combine them with the previous Ha images (Ha/synthetic/OIII). One of the problems that I keep running into is that the camera never goes back on the telescope in exactly the same plane as it was before. This causes problems when stacking images, with some sections of the image perfectly aligned and others off by several pixels. This can be fixed to a certain extent with post processing tools, but I would really like to figure out a way to attach and reattach the camera without having the focal plane tilt. This entry was posted on Sunday, July 27th, 2008 at 4:28 pm	and is filed under Amateur Astronomy. You can follow any responses to this entry through the RSS 2.0 feed. Both comments and pings are currently closed.